In south-east Asia, many devices on ambulance board are manufactured and projected in Italy. Here are the equipment used also in a rescue mission that is holding the entire world's breath. The story of thirteen young soccer players, called "wild boars", trapped in the "Tham Luang Nang Non" cave is keeping the entire world's breath. Rescuers are finding a concrete support also in the Italian technology. The Thai emergency system has chosen to equip their ambulances with many devices realized in our country. BANGKOK – More than fifty qualified divers from all over the world and the brave Thai Royal Navy Seal have been working in the turbid water of Tham Luang cave complex, located in the north of Thailand, to rescue all young soccer players. The “wild boars” and their coach have been brought out of the Tham Luang cave alive and in decent health conditions. This is not a miracle, this could have been possible only thanks to technologies and extraordinary skills of those rescuers. But there was not only the engineer Elon Musk with his team at Tham Luang realizing suitable rescue pods for saving the boys. There have also been decades of emergency devices development, like oxygen tanks and transportation systems used in the last hours to make a so-called “miracle”, while it is a system of sharpening human skills and equipment. 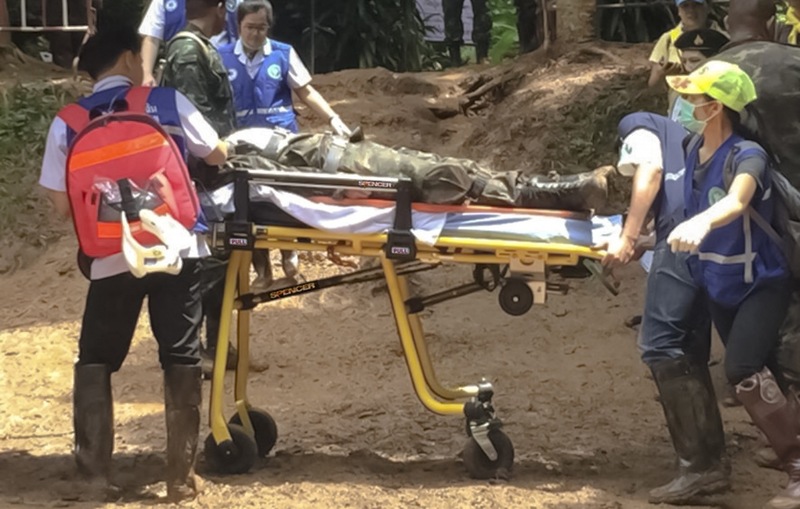 Stretchers – used to take boys out of the cave and that equip the Royal Thailand Police ambulance fleet – are Carrera Pro stretchers, projected to work without fatigue of the operator, even when the ground is arduous, awkward or – as Tham Luang cave – muddy and slimy. “When someone chooses a stretcher made by Spencer, the prize is that they are devices studied to be easily used by any rescuer, assuring a quick transfer, comfort for the patient and a maximum safety of the device“, explains Mathieu Gazard, Spencer area manager in Asia. to transfer patients with rachis trauma. A device projected by the Italian company in 2011 and which collected several prizes for its innovative system of children immobilization, according to their growth and height. Asian ambulances are typically equipped on LCV (Light Compact Vehicles) like Toyota HIACE, with a patient compartment integrated with the vehicle (4.43 meters length, 2.28 meters height). The maximum weight transported is not over 2 tons (2.110 kg) so it needs a light, compact and longlasting equipment. This is why on Thai ambulances we find Carrera stretcher, 4BELL transport and evacuation chair, and oxygen, monitoring and control systems made by Spencer in Italy, which tests and guarantees its products according to European, American and Asian Regulations. Nowadays thanks to these innovations, technical rescue operations we never thought to be successfully applied before, are possible. UK – Jeremy Hunt is no more Secretary of Health Department. Is NHS celebrating?